Mwahahahah! Mammasaurus is off having some family fun so I have crept in, had a good root around her cupboards and pilfered this week’s SatCap. I’m looking forward to browsing your oddities with some gin in a tin in her honour. I thought I’d share a little glimpse into my world. I have not had a desk of my own since 2007. I’m a nomadic project manager, turning up in other people’s offices, fixing their problems and then moving on. A bit like the A-Team, I like to think. This means I’m often confronted by people’s strange choices is desk decor which gives you an interesting insight into that chairs normal inhabitant. This week I have been sharing my few square feet of pine effect laminate with this Tracey Emin-esque art installation. So what was my predecessor thinking? If you fancy a bit of Cap this Sat then link up below, grab the funky badge and dive right in. The Lepracorn always ensured the mushrooms were pure magic! Who knew that mushroom soup made leprechauns do that…? Hahahahahha! I drank all her coffee! Mushroom soup you’re taking the mick. 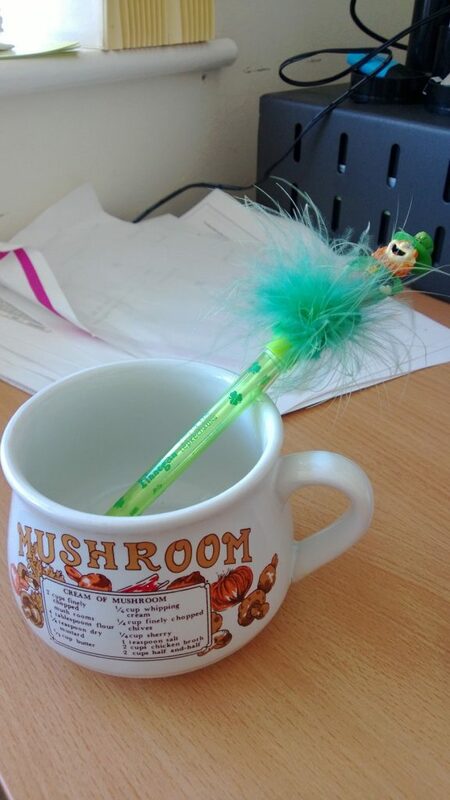 I’ve lost my spoon so the pen will have to do!